Clowns are a timeless classic whose wonderful sense of humor will never go out of style. They remind us of the days when a comedian hardly had to say a single word to make us roll around on the floor laughing. All they had to do was throw a pie at someone's face, and walk around in those giant shoes. So if you plan on joining the ranks of this noble profession, you'll need to fill some very big shoes, and master all of the classic jokes in the lineup. There's the banana peel slip, the slapstick duo (you'll need a friend for that one), and, of course, the water shooting gag. Some clowns prefer to fire their surprise attack out of a flower, but we've always loved the classic look of a bow tie. 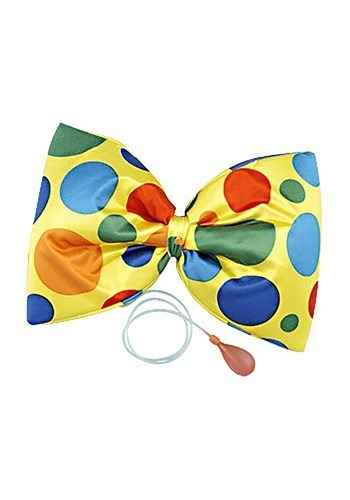 This yellow one with rainbow polka-dots will fit right in for you, and your good humored victims won't suspect a thing.